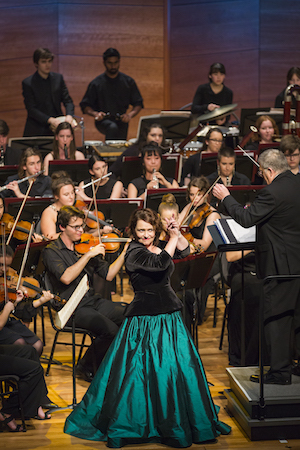 Magic descended on Mount Lawley on Saturday evening when Emma Matthews, together with the Western Australian Academy of Performing Arts’s Faith Court Orchestra under Peter Moore OAM, brought an imaginative programme to the Judith Cottier Theatre at Perth College. Whether it was the appointment of the much-acclaimed soprano – without question one of the operatic voices of our time – as Head of Classical Voice and Opera at WAAPA, or the approach of Leonard Bernstein’s centenary that inspired the event, the outcome was a stimulating and not-totally-predictable musical journey. As an opener, Debussy’s Prelude to the Afternoon of a Faun was a daring choice, its mostly-delicate sound palette leaving nowhere to hide; but it was executed with great confidence. Two of Henri Duparc’s exquisite art songs, pre-dating the Debussy by a quarter of a century, were conveyed by the soloist with distinction, the heartfelt interpretations expertly balancing the modest scale of the works, and going both to the heart of the songs and that of the audience. Vivid and fiery: Emma Matthews on opening night of ‘Glitter and be Gay” at All Saints College. Photo: Stephen Heath Photography. It was a tribute to the musical intelligence behind the programming and a compliment to the audience that the most obvious of openers, Rossini’s overture to The Barber of Seville, was shunted to third spot, providing instead a deliciously jarring contrast to what had come before. The orchestral sound carried with it the unmistakable, adrenalin-laden whiff of the operatic orchestral pit, rather than the luxuriously upholstered delivery of a concert hall performance; and so when Emma Matthews returned to the stage for “Una Voce Poco Fa”, exuding the body-language of a Rosina, we were in the mood for operatic fireworks… and, aided and abetted by a highly supportive orchestra, we were given exactly that by way of a vivid and at times fiery characterisation. Second half represented a fine tribute to Leonard Bernstein: as in the Rossini, in the short few moments between arriving on the stage and launching into her coloratura aria “Glitter and Be Gay”, Emma Matthews had already established herself as the hapless Cunegonde whose conflicting moods and emotions were beautifully projected in both facial and spectacular vocal expression. A more substantial salute to Bernstein brought the published programme to an end. Symphonic Dances from West Side Story was prepared in 1961, some four years after the opening of the musical itself, the composer re-setting a selection from the musical that reflects its contrasting moods. It therefore demands from an orchestra an extreme range from the reflective to the rumbustious. 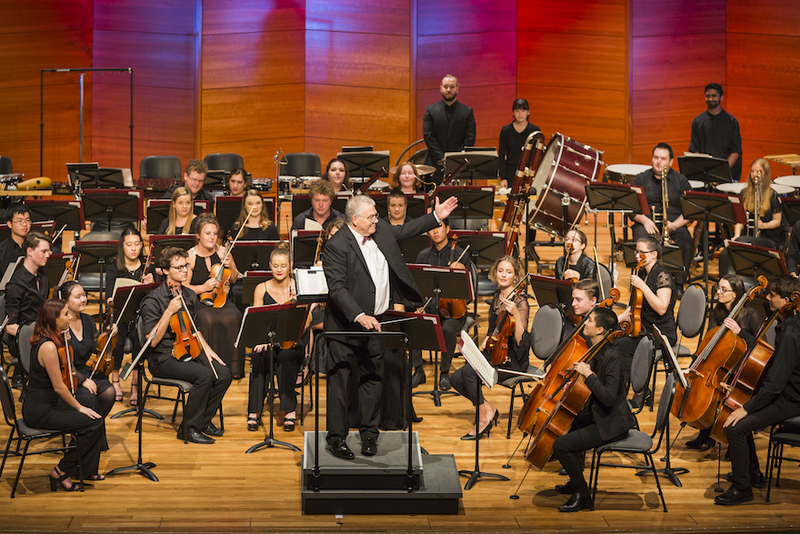 The orchestra met the many challenges of a distillation that one imagines must have been close to Bernstein’s heart, the rhythmic twists and turns and changing textures all executed with aplomb and with red-blooded intensity when at full cry. The segue into “There’s a Place for Us” was a heart-stopping moment and the “Maria” section was also especially well-realised. And finally, as a generous encore, Ms Matthews returned to the stage with the lilting melody of “Meine Lippen sie Kussen so heiss” from Lehar’s Giuditta to send an appreciative audience on its way. Some believe that despite – or perhaps because of – Perth’s remoteness there is, on occasion, a special magic to be found here. This concert was surely proof: for a suburban audience to be able to enjoy a diva in an intimate setting, feeling that she was enjoying herself as well, and to be able to hear the WAAPA orchestra under its inspiring director Peter Moore in its own neighbourhood, all of this made for an evening of music-making at its most communicative and enjoyable. Pictured top: Emma Matthews with Peter Moore and the Faith Court Orchestra on opening night of ‘Glitter and be Gay’ at All Saints College. Photo: Stephen Heath Photography. Peter Moore and the Faith Court Orchestra performing ‘Glitter and be Gay’ at All Saints College. Photo: Stephen Heath Photography.